Liber Libri Publishing, 9780999006405, 304pp. Michael K. Willis was born and raised in the Appalachian region of the Blue Ridge Mountains in western North Carolina. Willis received his bachelor's degree in political science and history from Western Carolina University and his master's degree in public administration from the University of Tennessee at Knoxville. He currently lives in Asheville, North Carolina. Michael K. Willis has a most engaging and endearing style. His memoir of physical abuse is lightened by humor and acceptance of that is just how it was back in those days. He was one of eight children born to a Baptist country pastor and his foul-mouthed wife, both of whom believed in whipping their kids, both physically and verbally, into goodness and godliness. It was a rough life for Michael and his siblings, but one he feels toughened him up to face the future in a world where social injustice and terrorism in all its forms is rampant. There was no love lost between the author and his parents, and yet, as he says in his epilogue, he recognizes after writing The Life of Mikey why they did what they did and acknowledges that all of us make mistakes, especially when raising children, thinking we are doing what is right when it isn’t. What prevents The Life of Mikey from being a depressing read is Willis’ style: it’s lightly reflective, often humorous, and moves at a fast pace. The Willis family changed homes and locations many times during the author’s journey into adulthood. Willis provides quick looks at the beautiful landscapes and towns in which the family lived. He barrels through important political events like the assassinations of Martin Luther King, John F. Kennedy and his brother, and all the turmoil surrounding the same. He reminds those of us who lived during those decades of the wonder we all felt at seeing our first televisions, or later, men landing on the moon. And all the while, he has us smiling in remembrance of our own childhood shenanigans and confusion about the adult world, not to mention the raised eyebrows at girls in mini-skirts! The Life of Mikey is a trip down Memory Lane, but not just for Michael K. Willis. While the geography of his upbringing and the family may differ from our own, there is much here on a personal level with which readers will identify. And that will keep them reading and enjoying The Life of Mikey. "All right, all you young’uns!" 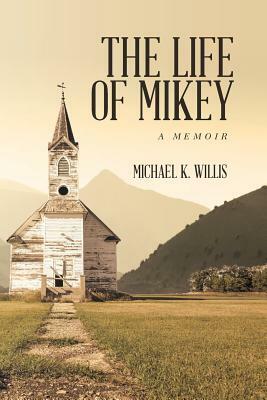 The Life of Mikey by Michael K. Willis tells the story of the author growing up as one of eight children of a minister in the Blue Ridge Mountains area of North Carolina in the 1950s and ‘60s. The family moved around a lot, eventually settling in Asheville, but Mikey and the others made friends wherever they went. The family’s life can be described as being in transition to modernity—they had a car, electricity, a telephone and eventually a television, but Mikey’s mother still canned vegetables herself and killed chickens by hand. Mikey, his brothers and their friends mainly spent their time outside school playing baseball and other sports, getting into mischief (such as finding a nest of snakes), riding their bicycles once they got to Asheville, and last but not least, fighting with other boys, especially bullies. The Life of Mikey is told in a straight narrative style. It is very entertaining, but it leaves some questions unanswered—for example, why Mikey and his brothers were so well-adjusted, despite the fact that their father was somewhat distant and sometimes whipped them just “on general principle,” and that their mother not only whipped them too but regularly cursed at them. It could be that the support of the close-knit community was enough to overcome these problems. Particularly interesting was Mikey’s parents’ reaction to the civil rights movement of the early ’60—his mother hated black people and warned her kids against having anything to do with them, while his father disliked racial discrimination but was uneasy about Martin Luther King’s use of civil disobedience. All in all, The Life of Mikey by Michael K. Willis is a fascinating look at a particular place and time in recent American history. The Life of Mikey: A Memoir by Michael K. Willis is an autobiographical novel about growing up in rural North Carolina as well as the impact that early childhood experiences, abuse, and neglect can have on someone forever. The Life of Mikey is written in a more or less sequential manner and follows Michael’s journey as one of several siblings who grew up in and around the Blue Ridge mountains. Michael’s father is a preacher and Michael writes about his father's external life as a respected member of the community and the frequent beatings and abuse that Michael endured within the confines of his home. His mother also deals with her own issues, along with raising several children, and the result is a childhood full of unhappy memories and neglect. The story is divided into several chapters and discusses Michael’s childhood, the beauty of the outdoors and the mountains of North Carolina in the '50s and '60s, their daily lifestyle, abuse at the hands of his father and occasionally his mother, becoming a teenager, young love, school life, and much more. I liked reading The Life of Mikey and the story, although simple, is told so candidly that its simplicity itself is the highlight of this book. A lot of the episodes described in this tale are simple things in the life of anyone living in a rural area, especially 50 years or more ago, such as fishing in the creek, raising and killing their own food, etc. I also liked getting a glimpse of how it was growing up in an era where racial segregation was officially ending and the ensuing racial tension in the South. The writing style is genuine and engaging and definitely kept me interested throughout. I also appreciated how Michael has drawn attention to issues of mental health and how early upbringing can affect someone in profound ways as an adult. All in all, I would certainly recommend this book.